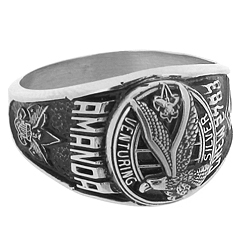 The female Venturing Silver Award ring is officially licensed by the Boy Scouts of America. Engrave your name, crew number or year on the sides. The Venturing Silver Award is earned by certain Venturing youth members of the Boy Scouts of America. Import. Siladium is comparable to a fine jeweler's stainless steel. It contains 12% nickel. It polishes to a high white luster, is strong, durable and guaranteed for a lifetime. Golden Siladium looks like karat gold, but without the price. It contains 12% nickel and is comparable to a fine jeweler's stainless steel. Another affordable alternative from ArtCarved! Available on select styles. This metal is ArtCarved's state of the art invention (patent pending). Silver Select is harder than other tarnish-resistant silver metals and more precious than Sterling Silver. It has a brilliant white luster familiar to sterling silver buyers with added strength from platinum. It is 95% silver, and 5% copper and platinum alloy.